Every Bingo players knows that the spice of life is playing your favorite bingo games. Spice Bingo adds the zest players are looking for. Register an account, login and let the site take you to a whole new level of tasty unexplored treats. It is guaranteed to offer new spicy flavors that will arouse your senses and taste buds that will have you craving for more. The theme of Spice Bingo has a clever concept that invites players to a market full of spices. Sacks of sweet peppers, chili pepper and a sack full of bingo balls are brimming over. The spicy flavors add an aromatic atmosphere that pulls players away from the kitchen and straight to the bingo rooms. Spice Bingo launched online in April 2013 and is a member of the 15 Network who has made an impressive mark in the industry. Bingo Vision software powers the games with an invigorating platform of products. The portfolio includes bingo variations and casino products. The no-download software allows instant access with special features for account history, pre-buy, Progressive Jackpots and a unique marketing package. The Alderney Gambling Control Commission regulates and licenses the site to operate. Spice Bingo abides by the strict guidelines and adheres to the laws. There are the best of three worlds with UK’s 90 ball, US 75 ball bingo including a suite of casino games. 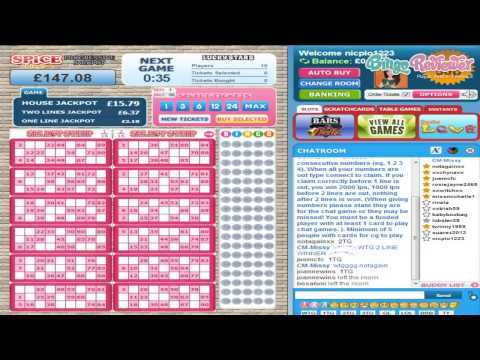 Chat Moderators are warm and welcoming and are available in all bingo rooms. A diverse selection of Bingo games, patterns, Progressive Jackpots, Chat box and Chat Games are your menu of tempting treats. There are games to appease the low roller and high roller with varied card prices. Scratch Cards have big Jackpots up for grabs with wagering starting at .25 to £1.00 per card. Instant Games cater to players looking for something different with Hi-Lo, Mega Bingo Keno and Pinball Roulette. A nice selection of Slots is offered with special features like 1024 ways to win, 5,000x multipliers, Scatters and Bonus games. Blackjack and Roulette are at the tables for those looking for a bit of action. You won’t find the same old run-of-the-mill promotions day after day at Spice Bingo. Besides ongoing promotions the marketing team creates new promotions every week and weekend. The Welcome package includes a Bonus and a chance to spin the Wheel for an additional Bonus up to £2,500. The Next Top Squad is a competitive Slot challenge played as a team offering cash prizes. Lucky Lotto will load you up with heaps of Points every Wednesday when your three chosen Lotto numbers are the first called out. Mondays are crazy with 1 line and Full House Jackpots that are switched! Fridays are jumping with the Take Away Game and a chance to win a free meal delivered straight to your door, Party Night and Friday Fever Jackpot game. Arriving online from the 15 Network and Bingo Vision camp, it is a breath of fresh air for players eager for a new variety of games and promotional incentives. The VIP Club offers a rewarding system and strives to continually improve adding additional benefits for loyal players. We rate Spice Bingo with 4 Pink Hearts. For a new online gaming site, I found myself very pleased with them, however, there are a couple of things they could stand to improve on just a bit. As for the positives, I think they have a nice welcome bonus and the best thing about them is definitely their free bingo. When it comes to free bingo, they offer it every single day to their funded players from 9am to 1pm. It’s difficult to find a negative side to four hours of free bingo daily ad a total of 24 games! The only downside is that the cash prize per game is only £1. They try to promote it like £1 for 24 games daily can really add up, but that’s only if you literally win every game, every day which is not very realistic. However, it’s still a good time. I really like their selection of slots and scratch cards. Their jackpots are very nice and for their bingo as well. I would have like to see at least one more additional variation for the bingo though. This is a fabulous brand new site! They really have a lot going for them, from their fun layout, to their promotions and awesome gaming selection. I was a little hesitant to join because I find that new sites often need a little time to work out their kinks but I was pleasantly surprised with this one! They have a very appealing welcome bonus going which consists of a 200% bonus as well as a free spin on their cash wheel. It gives players the opportunity to start out at the site with an additional £10- £2,500 in their pocket. I didn’t win too much on my free spin but with a minimum of £10, who could complain? It’s free cash all the same. Overall, they have a friendly, laid back atmosphere going for them. So far, I have not had any issues when it comes to payments and transactions, which is a great thing. I am in love with their selection of gaming and would certainly recommend others to try them out. This is one of the new sites that I have recently discovered, and it seems that it quickly became one of my favorites. It looks really nice and a bit like a cartoon and not a real casino. To be quite honest, the thing that attracted my attention was the fact that they have 4h Free Bingo every day, so you can just go and practice without making a deposit. On the other hand, if you want to get some of the bonuses, you will have to make a small deposit. I was not all that thrilled about the bonuses, but in my experience, the smaller the bonus amount is, the better result I get, and it was also like this in the Spice Bingo, and now I am waiting for the money to get in. You can find only 75 and 90 Bingo games here, which is a bit disappointing, in total of six rooms.